America’s expanding waistline may be responsible for another growing problem in our country – sleep apnea. Approximately 18 million Americans suffer from sleep apnea and many of them are overweight or obese. In fact, the most common cause of Obstructive Sleep Apnea in adults is obesity. Obstructive sleep apnea is a common and serious disorder in which breathing repeatedly stops for 10 seconds or more during sleep. People with this condition often have trouble staying in a deep sleep because their throats close, blocking their airways. As a result, they partially awaken to start breathing properly. They don’t realize they’re waking up and may become very sleepy during the day. Obstructive sleep apnea can lead to high blood pressure, heart disease, stroke, and even death. People with sleep apnea are also at an increased risk of work and driving-related accidents, due to inadequate sleep at night. It’s important that anyone with signs and symptoms of obstructive sleep apnea — especially loud snoring, repeated nighttime awakenings and daytime sleepiness speak with a physician. Fortunately, sleep apnea is treatable. Making an effort to lose weight is the best way to help people sleep better. Recent studies have proven that weight loss can significantly improve and potentially eliminate obstructive sleep apnea symptoms in obese individuals. If, however, weight loss attempts are not successful, a common and effective treatment for sleep apnea is continuous positive airway pressure (CPAP), where patients wear a mask connected to a machine that blows air into the throat, keeping it open while they sleep at night. If you believe that you have sleep apnea, it is imperative that you get tested. Speak with your doctor and request a referral to a sleep center so experts can perform an overnight sleep study. Jamaica Hospital operates a three-bed, fully private, sleep center. For more information, please call 718-206-5916. Can Too Much Sleep Be Bad For Your Health? “You have to get enough sleep if you want to stay healthy.” It’s a common phrase that emphasizes how important getting enough sleep is to our overall well-being. So if sleep is that important, it would make sense that the more we get of it, the better we will feel. However, the idea that there is no such thing as getting “too much sleep” is one that is totally wrong. In fact, chronic oversleeping can lead to a wide variety of health issues. While the recommended amount of sleep for adults varies based on age, activity level, and lifestyle habits, generally speaking, most adults should get an average of between seven and nine hours of sleep every night. Sure, it’s okay to sleep in a little late on the weekends, but if you find yourself requiring over nine hours of sleep on a consistent basis, or feel that you don’t feel well–rested when you don’t, it may be a sign of a another issue. For some, oversleeping could be due to a condition known as hypersomnia, which causes people to require unusually long periods of sleep at night and suffer from extreme sleepiness throughout the day. Those with hypersomnia also have low levels of energy, experience problems remembering things and do not feel recharged from a nap like the rest of us do. Hypersomnia is not the only reason one might require extra sleep. Other reasons may include the use of certain substances, such as alcohol or some prescription medications. Obstructive sleep apnea may also be another reason why someone needs more sleep as those with this condition have their sleep cycles obstructed, making them feel less rested. Lastly, depression is another leading cause for oversleep in many individuals as those who are clinically depressed are more lethargic and more likely to want to stay in bed. In addition to, or perhaps as a result of these other issues, those who oversleep have been found to have higher death rates than people who sleep seven to nine hours a night. If you are oversleeping, it is important to address the reason why. If it is caused by alcohol or prescription medications, look to cut back or eliminate those substances from your daily routine. If you think you are oversleeping due to depression seek help from a mental health professional. Likewise, if you have been diagnosed with hypersomnia or another medical condition, treating the disorder may help you return to a normal night’s sleep. You should also look to ensure that the sleep you get is restful by practicing good sleep habits. Try to establish a set bedtime and wake-up time, avoid eating a heavy meal or consuming caffeine before bed, and maintain a comfortable sleep environment. Exercising before bed can also help you relax and fall asleep easier. Jamaica Hospital offers a comprehensive sleep center, which diagnoses and treats a wide variety of sleep disorders. If you believe you require too much sleep, we can help you figure out why. To make an appointment at our Sleep Center, call 718-206-5916.
hat do half of all Americans do, but very few admit to, partly because they are unaware that they are doing it? The answer is snore. To determine the cause of your snoring, your doctor will review your signs and symptoms, review your medical history, and perform an examination. Your doctor may request an x-ray or other imaging tests to check the structure of your airway. To determine is sleep apnea is the reason for your snoring, a sleep study to monitor brain waves, breathing and heart rate, and blood oxygen levels may also be ordered. Lifestyle changes including losing weight, avoiding consuming alcohol before bed and changing your sleep position by either raising your head or sleeping on your side can reduce the liklihood of snoring. Other aids, such as nasal strips, form fitting mouth pieces, and short term decongestants for allergies or infections can also be helpful. If these efforts prove unsuccessful, there are a variety of surgical and non-surgical interventions that your doctor could recommend. 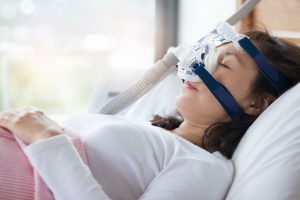 One of the most common therapies is continuous positive airway pressure (CPAP), which involves wearing a pressurized mask that pumps air through your airways while you sleep. Sleep apnea is a serious disorder that occurs when a person’s breathing is interrupted during sleep. Being overweight, over 40, or having a history of sleep apnea in your family are all factors that can increase your risk of developing this condition. Men are more likely to develop sleep apnea than women. Other health factors that can lead to sleep apnea include: reflux, GERD, sinus issues, allergies, or a nasal obstruction due to a deviated septum. Symptoms of sleep apnea include loud snoring, restless sleep, frequently waking up while you are sleeping (sometimes with a choking sensation), and waking up with a sore throat. Those who suffer from sleep apnea also feel tired and lack energy while they are awake, experience mood changes, have lapses in concentration, and are forgetful. These waking symptoms can result in decreased productivity at work or school and can lead to potentially dangerous situations, especially while driving. If sleep apnea is suspected, your doctor may recommend a sleep apnea study called a polysomnogram, which is a test administered by a qualified sleep specialist in a designated sleep center. While at the sleep center, you are assigned a private room where special equipment is used to monitor you. This equipment transmits and records specific physical activities while you sleep. Special technicians determine if you have sleep apnea. If sleep apnea is diagnosed, you may be asked to do further sleep testing in order to determine the best treatment option. The most common form of treatment is Continuous Positive Airway Pressure (CPAP). This is a treatment in which a mask is worn over the nose and/or mouth while you sleep. The mask is connected to a machine that delivers a continuous flow of air into the nose. This air flow helps keep the airways open so that breathing is regular. Another treatment option is the utilization of dental devices designed to help keep the airway open. Some might benefit from surgery if their sleep apnea is caused by a deviated septum, enlarged tonsils, or a small lower jaw with an overbite. There are things that people with sleep apnea can do to improve their condition including losing weight, avoiding alcohol and sleeping pills, and quit smoking. Other things that can potentially help are changing sleep positions to improve breathing and avoid sleeping on your back. If you think you have sleep apnea, speak with your doctor about a sleep apnea test. Jamaica Hospital recently opened a state-of-the-art sleep center for those in need. For more information or to schedule an appointment, please call 718-206-5916.